Make sure that the mockups you choose compliment and go with your brand. Prepare your graphics and screenshots ahead of time and import them into Canva. Try before you buy. 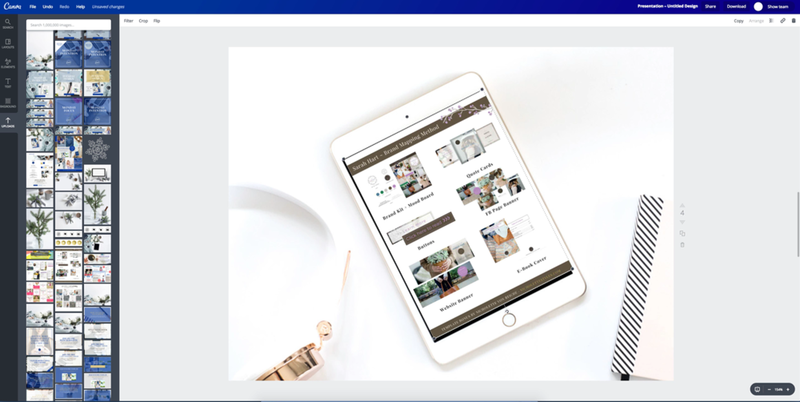 Screenshot the mockups that you like first, and trial them in Canva to see how they work with your graphics / screen shots, and then purchase the ones that worked the best and replace it with the high res version in Canva. Crop smaller section at a time to get your image dimension to fit perfectly. * these are affiliate links to products and small businesses we love, use and support. Are you a hand letter, writer of beautiful things, custom print maker or expert calligraphist? Have you crafted a beautiful business, but wish there was a little something that made your life easier? You know what we’re talking about - the nights sitting in front of your latest Netflix binge writing and rewriting the same quote over and over again for your next pop-up shop or Holiday rush on Etsy. Wouldn’t it be nice if you knew how to unlock a skill that could help you make a print or design once and use it over and over again without having to recreate it every time? Well, you are in luck. Together with Alex Estes of Prairie Letter Shop we’ve created something special that has the exact techniques to help you do just that. We’re in the business of helping your business. We want to help you work smarter not harder to create a sustainable, soul fulfilling, freaking profitable creative business. In order to do that there are a unique set of tools that you’ll need first. We sat down with Alex and grilled her on the exact tools she uses to run her own creative business (you know the one that 3x her income after she left her job as an English teacher). We begged her to spill the beans on the things she uses every single day to create beautiful prints, replicate them and sell them. Since Alex is the kindest human being on Earth she obliged. So just for you, here is your free guide to The 20 Tools the Hand Lettering Pros Use so you can make sure you’ve got the tools to be pro. We want you to start where you’re at. There’s no sense in overwhelming you with #AllTheThings that “could” help your business or teach you new things. We just know that when you’re equipped with the things that work you can get to work faster and smarter. Find out the tools the pros use. Once you’ve got your toolbox full of the latest and greatest (there are even links built right in to that resource so you can get them in your shopping cart right away) then you’re ready to rock and roll. Because you’re investing in the things that have taken other businesses years to figure out that means you’re already ahead of the program. You’re already better equipped than 90% of anyone else in the industry. How cool is that? After you download The 20 Tools The Hand Lettering Pros Use you’re going to unlock some more free training that we created just for you. We’re taking you on the journey with us so you can learn from our mistakes and see how three creatives got to do what they love (and get paid for it). We all started in different places so we’re sure you’ll see yourself in one of us. Maybe you went to school for something else entirely and realized you had a creative hand. Maybe you picked up a pen while the kids were in bed and fell in love. Or maybe you hand lettered the invitations for that one friend’s wedding and thought, “Hey, I could get paid for this”. Either way you’re in just the right place. Don’t forget to grab your free resource The 20 Tools The Hand Lettering Pros Use. Did you love that guide? We'd love you forever if you shared it with all your friends. We've even crafted this tweet for you to click and go just like that.